When Artie Lange joined the permanent cast of "The" "Howard Stern Show" in 2001, it was possibly the greatest thing ever to happen in the Stern universe, second only to the show's move to the wild, uncensored frontier of satellite radio. Lange provided what Stern had yet to find all in the same place: a wit quick enough to keep pace with his own, a pathetic self-image to dwarf his own, a personal history both heartbreaking and hilarious, and an ingrained sense of self-sabotage that continually keeps things interesting. A natural storyteller with a bottomless pit of material, Lange grew up in a close-knit, working-class Italian family in Union, New Jersey, a maniacal Yankees fan who pursued the two things his father said he was cut out for--sports and comedy. Tragically, Artie Lange Sr. never saw the truth in that prediction: He became a quadriplegic in an accident when Artie was eighteen and died soon after. But as with every trial in his life, from his drug addiction to his obesity to his fights with his mother, Artie mines the humor, pathos, and humanity in these events and turns them into comedy classics. True fans of the "Stern Show" will find Artie gold in these pages: hilarious tales that couldn't have happened to anyone else. There are stories from his days driving a Jersey cab, working as a longshoreman in Port Newark, and navigating the dark circuit of stand-up comedy. There are outrageous episodes from the frenzied heights of his coked-up days at "MADtv," surprisingly moving stories from his childhood, and an account of his recent U.S.O. tour that is equally stirring and irreverent. But also in this volume are stories Artie's never told before, including some that he deemed too revealing for radio. 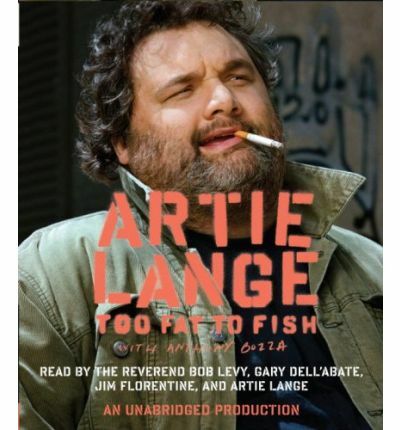 Wild, shocking, and drop-dead hilarious, TOO FAT TO FISH is Artie Lange giving everything he's got to give. And like a true pro, the man never disappoints. About the Author: Artie Lange is a comedian, actor, and cast member of The Howard Stern Show. A former star of the cult television show MADtv, hes also appeared in the movies Dirty Work, Elf, Old School, and Beer League, which he also co-wrote and produced. Artie lives in New Jersey.Anthony Bozza is a former Rolling Stone staff writer and the author of the New York Times bestsellers Whatever You Say I Am: The Life and Times of Eminem; Tommyland with Tommy Lee; and Slash with Slash. He lives in New York City.